Ownership / Access: Christopher Slattery. Notes: Killeen Castle, located in Dunsany, County Meath, Ireland, is the current construction on a site occupied by a castle since around 1180. The current building is a restoration of a largely 19th century construction, burnt out in 1981. Killeen was built as one of a pair of castles either side of a major roadway north, the other being the extant Dunsany Castle. In 1989, a new development plan was proposed, and later revised, with multiple applications for permission, including the conversion of the castle into a high-end hotel, the installation of a championship standard golf course and the construction of more than one hundred units of luxury housing on the estate. With successive modifications and discussions, plans were approved, with conditions to protect parts of the demesne landscape, and estate features, including a holy well. Work began in 2005. 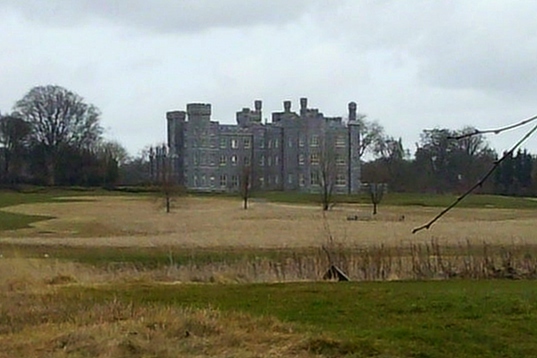 In August 2006 it was announced that Killeen Castle would open in 2009 as a 179 room luxury golf and spa hotel under the Starwood Luxury Collection brand. However in early 2009, Starwood withdrew from the project after plans were scaled down by developers Snowbury following a downturn in the tourism and leisure industry. On December 14, 2006, after over a year of bidding, Killeen Castle was chosen as the host venue for the 2011 Solheim Cup, the first time Ireland had ever hosted this event, despite the fact that the golf course had yet to be constructed. The 18-hole championship course was designed by Jack Nicklaus and opened in 2008; it hosted the revived Ladies Irish Open on the Ladies European Tour in August 2010 and 2011 in the run up to the Solheim Cup. Dave Pelz Scoring Game School opened at Killeen Castle estate in June 2008, with a focus on the game within 100 yards (91 m) of the hole. The Killeen Castle estate contains seven lakes, that are stocked with rainbow and brown trout.